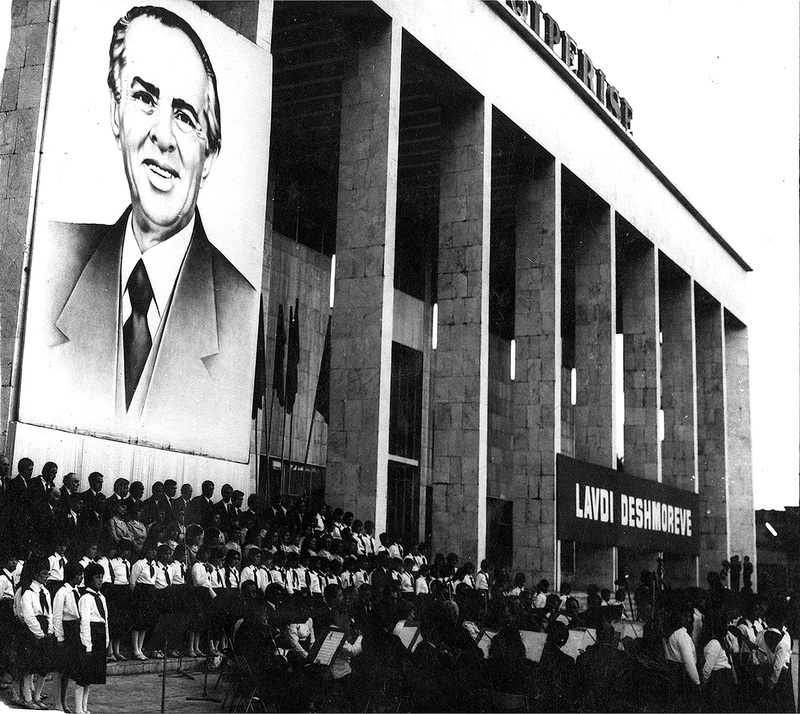 The leader: a massive portrait of Enver Hoxha decorates the main entrance to the Palace of Culture in Scanderberg Square, Tirana, early 1970s. Original photograph taken by Niko Xhufka then retouched by communist officials. In May 2012 I reviewed a book, Rhythms of Albanian Life by Niko Xhufka in which I shared some of my impressions of his work. I’m delighted to say that Niko saw my review and got in touch with me to provide some additional information about his photographic practice and the context within which it was created. As I mentioned in my earlier review, information about Albanian photography during the communist era is difficult to find in English, so my piece was based mainly around my own impressions of his work. To have the opportunity to learn more about his photographic work and career was a real privilege and I hope that this interview will contribute to a greater understanding and appreciation of Albanian photography. Once again, I would like to thank Niko Xhufka for sharing his experiences and for providing these insights into his work as a photographer as well as the examples of his work seen here. And I would like to express my gratitude to Genti Gjikola for all his skill and hard work in preparing the English translation. I think anybody interested in photography and how it operates in the context of a repressive regime is going to find this interview an absolutely fascinating read. You worked for ‘Zeri i Popullit’, the main Albanian newspaper during the communist era, for 30 years. Can you tell us a bit about what it was like to work in that environment as a photographer. I was a 16-year-old teenager when I started work as a reporter for the Albanian Foreign Affairs Ministry in the mid-1960s, working for the monthly journal ‘Shqiperia e Re’ [New Albania]. This was my start, I worked for about a month there, and then I moved to the ‘Zeri Rinise’ [Voice of the Youth] newspaper where I worked for nearly two years. It was here that I was ‘discovered’ as a talented photo-reporter, moving as a result in 1966 to the ‘Zeri i Popullit’ [Voice of the People] the biggest and most important paper of the Communist regime. My superiors appreciated my talent, but also my composure. I was quiet, reserved, got on with the job, didn’t speak much, carried out assignments without much fuss and objection, always at the low end of payment. I think for this job they had found the suitable person. When I went there, I joined a staff of just one other person in the photo-reporters’ office. He was about 45 years old. Being on his own for a long time, he was used to doing as he pleased, and he made it clear from the beginning he didn’t like my company. I believe my joining the staff made him uneasy. I guess he feared the fact that so soon after joining, my photos were being published a lot more than his. This worsened our professional relationship, not that it was any good before, but still we hit a new low to the point where he threw acid on my films in the lab. I reported the incident to the chief editor, who then called in some forensic specialists who backed me up on my claims: yes, there was acid thrown on my films and it looked deliberate. As it was only the two of us using the lab, the culprit was not hard to find. The punishment would have been a lot more severe were he a lesser-connected man but they shifted him upstairs where he faded away to a second-hand role. Working conditions at ‘Zeri i Popullit’ were appalling at that time. There was a tiny photo lab with no suitable equipment. The cameras when they were not falling apart at the push of a button were forever faulty as they were second-hand bargains bought in Eastern European countries at a very cheap price. I worked with Praktica, Leica and Praktisix 6×6 cameras made in East Germany, or with Russian-made Zorki and FED 1. These were all my treasures as a photo-reporter. My travelling up and down the country was made atop of a Czech-made JAWA motorbike owned by the newspaper. On rare or urgent occasions or very important assignments I was given permission to use the newspaper’s car. There were times when I have used helicopters to take pictures and on some rare and frightful occasions I have even taken pictures on an Antonov – An2: an agricultural biplane used in forestry and agriculture. The consignment of the photographs taken for the newspaper followed a strict sign-on procedure. 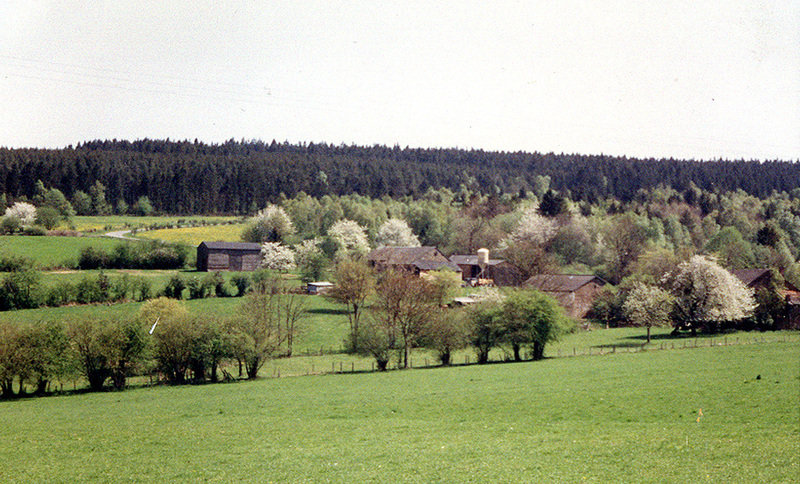 The same procedure applied for use of film. The allowed amount of shots per subject was miserly, up to three shots per photo, and if I had used more shots than the norm they would deduct money from my wages at the end of the month. If anything, it shows how poor the country was at the time. In the beginning, I was being punished a lot for this but later on I learned the ropes and the tricks and got by. I think this made me feel differently about the photography process, as a sniper would when hitting a target, a single shot, maybe a second, and that’s that. The developing and printing process also got me into trouble in the beginning. You had to be careful with the paper and the solutions. I developed on tiny formats, 5 x 5 cm, where I would see the main parts of the photo, contrast, light and depth. Only when I was pleased would I develop it to a bigger format for use in the newspaper. There was a weekly check and audit of the materials used in the lab, the tiny 5×5 proofs would be gathered and put together in a box with a label on it. I worked at ‘Zeri i Popullit’ for a long time and had about ten different editors-in-chief. From all of them only Todi Lubonja, a member of the Central Committee of the Albanian communist party, supported my ‘artistic line’ in photography. All the others were rather cold or disinterested about art and photography. Todi Lubonja was arrested and given a long prison sentence in 1974 by the communist regime for ‘activities on behalf of the enemy’. Destruction: diptych made on the spiral staircase of the Palace of Culture, Tirana, 1997. The collapse of Ponzi pyramid schemes led to widespread destruction and looting by angry mobs and people with nothing to lose. 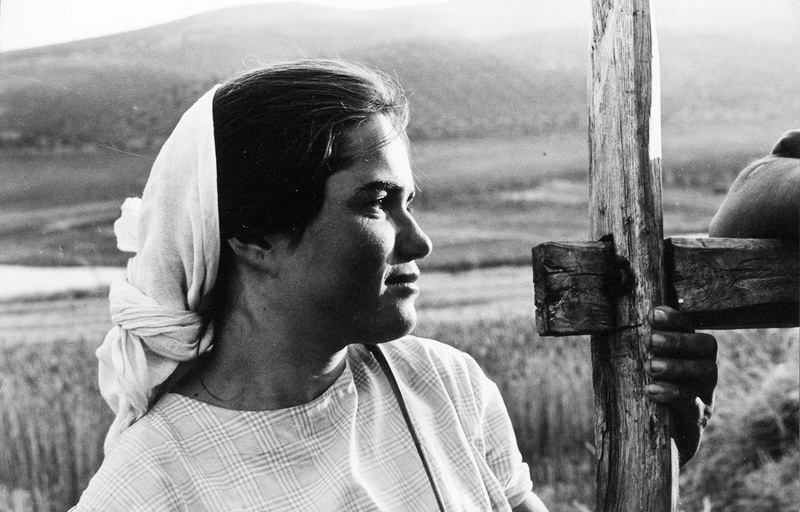 Photography in Albania during the communist period seems to have been a rare activity because of the difficulty in getting camera equipment as well as the suspicious attitude of the authorities towards taking pictures. So you must have been only one of a small number of photographers working at this time. Can you tell us the difficulties you faced as a photographer in Albania during the communist era, particularly in terms of the subjects you could photograph? A photo-reporter in the communist era was under constant surveillance, heavily censored. Few people had photographic cameras, and the majority of them were old models in a sorry state. The state had a monopoly on the buying and selling of photographic cameras and equipment. Private property and private merchandising was forbidden. To take pictures of people in administrative and state positions, of foreigners, or of state events and proceedings, you first had to have permission from state authorities, otherwise you could end up in a police station. The person photographed had to have a clean biography, had to be checked and verified. Outside the members of the politburo, I did not have any difficulties in taking photos. Owing to thorough preliminary work by the newspaper’s editorial desk, everything was quite clear to me from the beginning: the theme, the subject, and the ‘category’ of the people I was going to photograph (i.e. the working class or miners). Usually I would choose the person to photograph within the ‘prescribed’ category, based on their portraits, bodies and facial features. When you went to photograph somewhere, always the first thing to do was to stop by the Party’s offices in that particular place. These were offices within working facilities that knew everything, ran everything; they would then give you ‘orientations’ about everything. If the subject to photograph was a person, they would make sure to put forward a bunch of ‘Stakhanovite’ or ‘model workers’, those who had exceeded their work quota output, and that had a good ‘biography’. Otherwise just to turn up and photograph ‘as you wanted’, people whose features you felt drawn to, or work in ‘artistic angles’, or simply to work out of sync with the orders of the editor’s desk would land you in dire straits. To take pictures of prisoners or ex-prisoners, kulaks, or of ‘enemies of the working class’ could put you in a lot of trouble, quite possibly in prison. I remember a case I would like to draw attention to. Years ago my little daughter was taking music lessons from a female music professor. The police called me to the Ministry of Interior headquarters and told me in a very clear manner not to let my daughter go to that person any longer, not to take any more pictures of them, and not to enter their house at all, as they had a bad reputation and bad ‘biographies’. The army of spies in the neighborhood had spied on me. The war of the classes’ had to be observed at all times. On this occasion, they also tried to recruit me to become a spy. But I told them clearly I was only a photo-reporter, that the camera was my only weapon and left. In hindsight, I believe they were not serious about recruiting me and the whole story was only a provocation to test my reaction. But some of the portraits in ‘Rhythms’ are people not vetoed beforehand. Of course, the majority are the heroes of that time, people who worked full of vigor on different fronts of socialism, and factually most were ‘model workers’. But the majority of the old people in the book, who lived in high and remote mountainous areas, especially found towards the end of the book were uncensored people. I once remember walking on foot 70 km from Shkodra high up in the alps in the Vermosh region, in difficult terrain and dangerous weather, just to capture the faces of some very old Albanian highlanders. There was no Party office to turn to up there, and the houses were few and far between, scattered at a great distance from each other. Here I could do as I wanted. However, highlanders were not particularly much sought after, workers and work heroes, yes. For the paper, the highlanders were not that important. Children too didn’t get much censoring, but it was considered an advantage if they were children of communist fathers and work heroes. 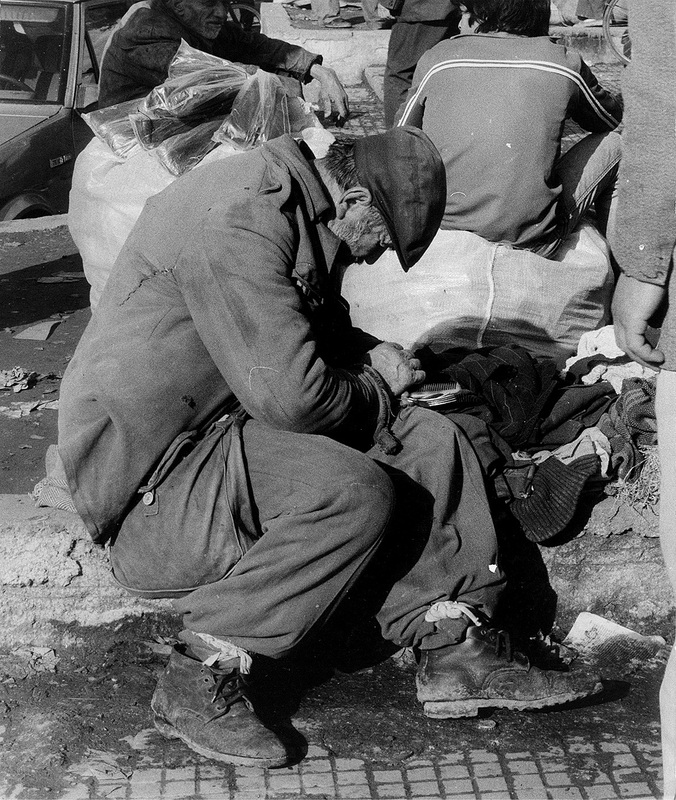 A beggar, Tirana, early 1990’s, right after the fall of Albania’s Marxist regime. As a photographer, it must have been very difficult to operate under these limitations. Do you feel as if they restricted your creativity in any way? It is inherent in the nature of dictatorships to censure every person and every undertaking, job, activity. Every artist back then, myself included as a photo-reporter, could only develop under the ideological straightjacket and clearly defined political boundaries the communist state had laid. My artistic photographs have been taken through ‘maneuverings’. There are some photographs people called cubist back then, those counter-lit (back-lit) photographs of the late 1960s and early 1970s. Those made it through only by the backing and support of Albania’s League of Writers and Artists. The League had the authority to sign off on them. There was no chance to develop your creative language by taking pictures the way you liked, to experiment, or take pictures of whatever subject stirred your interest. My duty was to make beautiful photos and compose them artistically. It is a bit difficult for me to explain what was meant by ‘beautiful’ at that time, but an ever-present element of beauty was: happiness, laughter, gaiety, joy. The human being had to be photographed always happy and involved. Thinking types were not liked and never made the final cut. You could only portray the Politburo members as concentrated in deep thought but not always. The rest of us had to be concerned with work, the future, the contribution, and action. Reflection in art was not allowed for there was censure everywhere. I believe that before he takes a shot a photo-reporter has that shot it in his mind, in his brain; there is a certain angle, a certain expression you want to stress. The counter-light attraction was just natural for me; nobody lectured me on that, no one showed me books or journals. I searched out the counter-light photos, I hunted for them, because I felt them, but they needed also graphic composition. These considerations were needed to capture the movement, the speed, and the dynamic, not the status-quo of the subject. I can say I worked on instinct. Portraiture and landscape attract me deeply. The portrait expresses the beauty, the drama and the inner workings of a human being, which the surface does not show. I believe drama in photography comes from the state the human being finds himself in. The plastic side of a face for me is quite an important element. As a photographer, I preyed on my subjects and I believe I have stolen their portraits. The portrait shows me the inner man and I am attracted by the human condition and existence, the human soul; the portrait only speaks. When I went to photograph back then, the first thing after getting permission was to look for faces, peoples’ faces that did the work I was trying to capture. That was the first thing I had in mind. Then there is the landscape. Landscape gets you down on your knees. Of course, you must find the essence, its core. The surface is usually dry; you must dig in, beyond the surface, where the real world begins. What you capture when you get under the skin of things and people is important but also there must be feeling. Without feeling there is no photo. I am like an actor who gets inside his role and lives in it. Only then I strike my photos away. Most political leaders are very conscious about their image and how they are photographed. What was it like to photograph Albania’s leader, Enver Hoxha? It is only natural that public personalities divide opinion. Some of them look good and some not so good when they are photographed. I have to be honest and say that it was a great honour at that time to be able to photograph Enver Hoxha since, as you know, sometimes even cabinet ministers could not get close to him. I was appointed as a photographer that was to take Hoxha’s official portrait. This was beside my photographs for the paper. Hoxha’s portrait was easy to capture, dead easy. He was a born actor, a real master that slipped in and out of a role seamlessly. But it was hard too, the hardest portrait to take because if something in his portrait wasn’t right then you had problems, you were an enemy of the state, someone who wilfully is trying to distort the great leader’s image. Enver always had to be photographed smiling, strong, beautiful, a leader full of character and psychology, born proud and naturally wearing it. 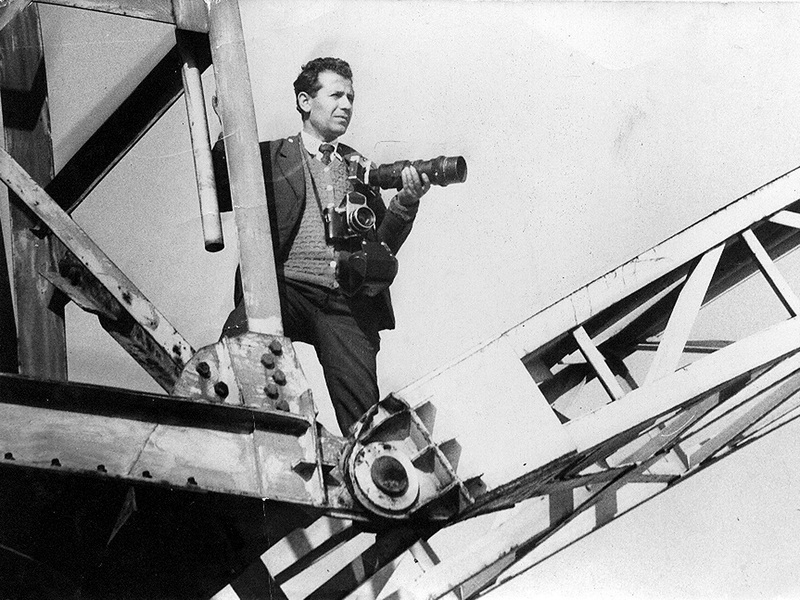 The publication of his photos was a job of the Press Sector, a structure within the Central Committee of the Albanian communist party. They received all material about him, written or photographed and held it under a microscope, so to speak. Every dot of Hoxha’s portrait was examined by them, every turn of the head, every light-shadow aspect. I don’t know who finally decided on the publication of the photo but I believe either Hoxha himself or his wife, Nexhmije Hoxha, did. I don’t know of Hoxha, after he took the reins of the country, to have sat for photographs of him (apart from those in group photos). There are many photographs of his but in my opinion he did not ‘sit’ for those consciously. In his villa, you could not enter and the nearest I have gone has been the fence of his front garden. As I said already, it was nearly impossible to enter his house. All the photos inside Hoxha’s house have been taken by Sulo Gradeci, his personal bodyguard of thirty years, a rather cold and formal man. There was a party congress in the city of Vlora, down south. Enver Hoxha was there. I took an instant picture of him without thinking twice for composure or lighting. He was talking to an old man, about ninety years old. But Hoxha noticed me and told the old man to turn around and face the camera, since there is a photographer taking pictures. ‘It will be a nice photo’ he said ‘and he will give it to us in the end.’ But the microphone was on and everyone in the room heard it. At that very moment, everyone assembled stood up and started applauding enthusiastically. It was surreal. The photo was published the next morning across the front pages of every paper. Another time, it was election day in Tirana. The newspaper’s chief editor had told me not to turn up for work anymore due to the complaints of an arrogant communist chief in a position of importance. That day all the photo-reporters of the printed press and media went to the District’s Party’s Committee to get permission to photograph the Albanian politburo on election day. When he did not see me turn up to get the said permission the General Secretary of Tirana’s party committee ordered that I must report immediately for work. He then got on the phone to my paper saying I could not be laid off, and that was that, no explanations given. I went straight to the polling station where Enver Hoxha was due to vote. There were only three reporters present when Enver Hoxha came, myself, the guy from RTSH [Albania’s state television] and another guy from the ‘New Albania’ Kinostudio [Albania’s national film studio]. Next day it was my photo that was published across the front pages of the papers. The photo was very well received and got a lot of positive coverage in political and artistic circles. Then on the day of the publication suddenly Sulo Gradeci turns up. He told me that he was coming on the orders of Hoxha personally and wanted fifty copies of that photograph. Hoxha wanted to give it as a memento to the veterans of the Second World War. A week later Ramiz Alia, who was to follow Enver Hoxha as head of the country when Hoxha died in 1985, gathered all the press heads in a meeting to analyze the polling day dynamics and reports. Alia said that Niko Xhufka on the merit of that photograph alone shouldn’t be working for the next five years and still be duly paid by the paper, for the photo was excellent. Another episode was when Enver Hoxha was returning home from the polling station on a different election day. I took the liberty to enter without permission the ‘Bllok’, [the famed and soldier-protected estate where the members of the Politburo lived in close proximity to each other] and got near to Hoxha, who at that time was playing with his little nephews and nieces in front of his house. Hoxha saw me and told me to get closer. I approached the scene uneasily, but he told me he wanted a picture of us together. He put his hand around my shoulder and Sulo Gradeci took a picture. For me this was a big thing. Your book, ‘Rhythms of Albanian Life’, was one of the few photographic monographs to emerge from Albania during this era. It provides a rare insight into a country that was hidden from the rest of the world. I just wonder if you could tell us a little bit about how this book came about and the process that went into making it. As a member of the Albanian League of Writers and Artists, I could take two months a year for what was called back then ‘creative leave’. This creativity leave was given to everyone who was already a member of the League. There were various lengths of it but two months was considered to be quite generous. During the creative leave, I would travel up and down the country according to the project I had proposed. During this time, the League would pay my salary: about 1000 Albanian lek from the usual 700 I made a month at the paper. When I went ‘creative’, the correspondents of the Albanian Telegraph Agency would cover my work at the paper. The leave had its own rules, although it was not a nine-to-five job. We had to produce every receipt of every meal eaten, every hotel we slept in, every vehicle we boarded. The League was quite strict about such things. The ‘Rhythms’ book was a project born out of collected photographs from several creative leaves. The decision to publish this book was entirely mine; there was no political pressure to produce it. If there was any pressure it was from the fact I had to justify my receipts of several leaves. However, before it got published I got the rubber stamp of the League to go ahead with publication. They would back me up if there were any problems, political or financial with the book after it got published. Their support was quite important, I would say vital. In my opinion, ‘Rhythms’ has stood the test of time and has received just praise. To think, this album was published in 1976, at a time of great difficulty for Albanian art, especially after the 4th plenum of the Albanian communist party in 1973, a watershed moment in Albanian history, especially in the history of the arts. The album covers all the main themes of the time: portraits, children, miners, work, mothers, peasants, soldiers, youth and old age, but also compositions. The album has photographs that were difficult to publish at that time. I especially have in mind those cubist and counter-lit ones. But I managed to surround them, to ‘bury’ them, under those depicting the stable photographs of the march of socialism in Albania. Many visual artists in Albania have used my photos for their works, to the point of receiving important national prizes. The finest painters and sculptors of that time wanted my company, because they understood my talent and wanted me to take the pictures of their works. 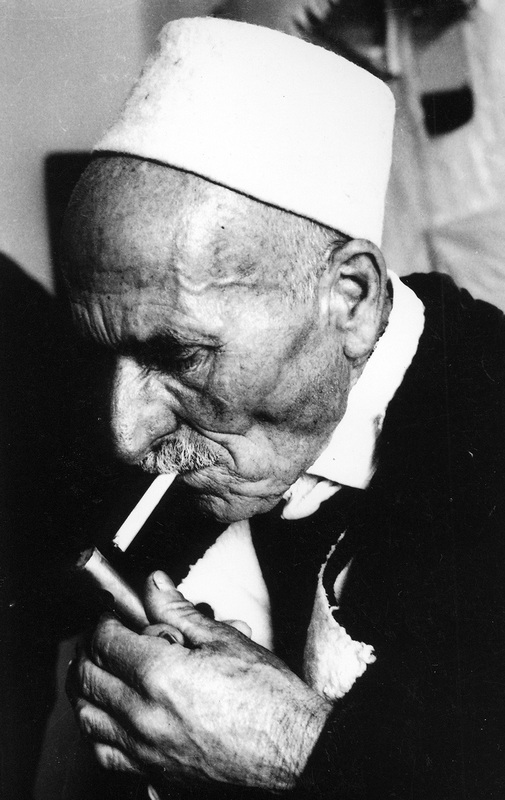 Odhise Paskali, possibly the greatest Albanian sculptor of the 20th century, relied only on my effort to document his work and himself working. He would always pay me at the end of a session, almost to the point of forcing me to accept the money. He was the only one to do this, then almost an unheard thing in my profession. I have also photographed more than any other figures, Ismail Kadare, possibly the greatest Albanian writer of any time; Dritero Agolli, a very important writer and mentor for me, and Xhezair Spahiu, a great Albanian poet. 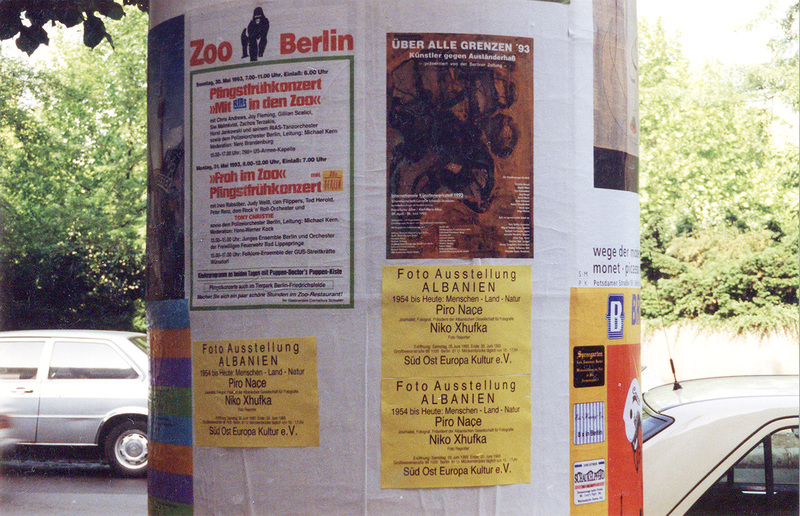 During the 1990s and 2000s you had a number of exhibitions in Italy, Germany and France that were very well received. I wonder if you could tell me what it was like to show your work in that context? After the fall of the totalitarianism in Albania, through a lot of financial hardships, I have managed to open some exhibitions, I would say successful ones, in Albania, Italy, France, Germany and Belgium. In Albania, I have displayed my work in exhibitions held at some of the most important artistic venues of the country such as the Historical Museum of Albania, Tirana’s Palace of Culture and the hall of Albania’s League of Writers and Artists. I have been awarded four first prizes and many second ones. In the Mediterranean Exhibition of Photography held in Italy in 2004, I was awarded second prize. I was awarded a prize in Cuba and the ‘Naim Frasheri’ Medal of Arts in Albania. In Rome, in 1993, I managed to display my work at three exhibitions simultaneously, all within the space of a month. 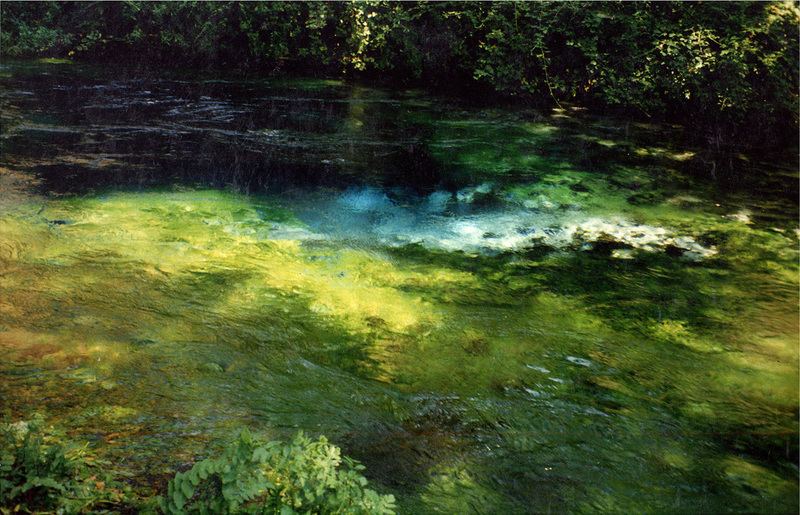 During a visit to one of my exhibitions an important director of RAI (Radio Televisione Italiana) stood in awe at one of my photographs, the one entitled ‘The Blue Eye’ (a famed 45 meter deep water spring in the south of Albania). He told me he could not believe that this was a photograph; he insisted it was a painting, and I had to open my negatives and show him that it was a picture I had actually taken. He told me that my work was one of the most striking he had seen in a long time and that, for me, was one of the nicest things someone has said about my work. Costanzo da Agostino, the great Italian publisher, who really liked my photos and chose ten photographs for publication in a special edition, visited the same exhibition. These photographs were accompanied by some delightful poetry, written by the former Albanian cultural attaché in Rome, the writer Visar Zhiti. For the other exhibitions in France, Belgium and Germany, there has been a lot of interest from the local and national media of these countries. As an artist in two different eras, can you tell us a bit more about the differences in the creative process then and now? I have ambivalent feelings for that era. Not for the conditions we worked in, but for the art system the government of this country at that time managed to build. The conditions were hard and very unhelpful. I could only get second-hand equipment from the East. I didn’t have my lab, and I would always process photos by hand, never having enough solution for their development. And then there was the censorship. But on the other hand, it was a system built on a hierarchy of values within which personal talent and vocation, most of the times were influential factors, almost decisive ones. If you were an artist back then you had a different identity, you were important. Unfortunately this thing does not happen today in Albania. It continues as a pale shadow of that system without managing to create its own identity when compared with the past. In my opinion, Enver Hoxha loved and respected art, of course using it to his own ends most of the time. But nevertheless you must love art and understand its power before you get to the point of using it for your own ends. I think he did things for the art of that time. The artists were given personal art studios, received titles and were handsomely rewarded. People received creative leaves, and most of the time there were real debates about the arts and their role in society. Whereas today nothing of this sort happens and no one cares about the arts or artistic creativity. If you are an artist today in Albania it’s embarrassing, it’s sad and I think you become a problem for your own family. You also published ‘The Arberesh of Italy’ in 1996, which documents the Albanian community in that country. Can you tell us something about that work? In Cozenca, Italy, the president of the Albanian Arberesh League asked me to work for three months on the development and the setting up of the museum of Arberesh. During this time, my task was to complete the album on the Arberesh of Calabria and Sicily. The book was published after the opening of the museum and had a very good reception both in the Calabrian, Sicilian and Albanian press. You say you’re still busy taking photographs now. Can I ask what you are working on these days? Right now, I am working on an album about the castles of Albania, especially on those founded, defended or taken [from the Ottoman Turks] by Scanderbeg, our national hero. I am also working on an album of black and white photographs from the 1960s to the 1980s. As I am trying to include the majority of the photos that went unpublished during that time, this is a slower and more time-consuming process. It also feels a little strange to re-introduce those pictures from an era long gone. I guess this is a more historical process than the castle project, despite the fact that the castles date from medieval times. Niko Xhufka, thank you very much for sharing your experiences and work with us. All images copyright Niko Xhufka and used with his permission.